BY Lauren Johnston: : Sometimes we need a mantra to press forward through the marathon agony. If you're looking for one, may I suggest you repeat the words "Fauja Singh. 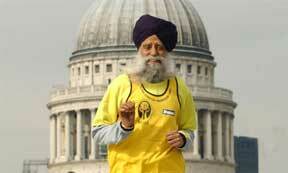 Fauja Singh," the name of a 100-year-old man who on Sunday became the world's oldest runner to complete a marathon. October has already yielded some amazing feats in running: a woman ran the Chicago marathon while nine months pregnant the gave birth immediately after and athletes set insane records at this year's Kona Ironman. And now Singh, nicknamed the "Turbaned Torpedo" has made history with his amazing 26.2. Singh ran the Scotiabank Toronto Waterfront Marathon on Sunday and earned a spot in the Guinness World Book of Records after he crossed the finish line last of the pack (3845th) with a time of 8:25:16. Singh had hoped to finish the race in about nine hours and was ecstatic to crush his pace goal, his coach said. "Beating his original prediction, he's overjoyed," his coach and translator Harmander Singh told the Associated Press. "Earlier, just before we came around the [final] corner, he said, 'Achieving this will be like getting married again.'" Singh, who hails from London, speaks only Punjabi and issued statements through his coach. The Toronto race marked Singh's eighth marathon. He ran his first when he was 89, an age at which most runners have been long since retired. Sunday's race was not the first time Singh set a a record in Toronto- in 2003, he ran the course in 5:40:01 setting a record in the age 90 and over category. The five-foot-eight, 115-pounds endurance sport wonder attributes his physical fitness and longevity to abstaining from smoking or alcohol and to following a vegetarian diet. Singh, a British citizen, is not planning on slowing down after setting his latest world record and in fact already has his eye on his next great feat: He will participate in the torch relay at the 2012 Olympic Summer Games in London. Fauja Singh (born April 1, 1911) is a centenarian Sikh. He is a marathon runner of Indian descent who is a world record holder in his age bracket. His current personal best time for the London Marathon (2003) is 6 hours 2 minutes, and his marathon record, for age 90-plus, is 5 hours 40 minutes, at the age of 92, at the Toronto Waterfront Marathon 2003. In 2004, Singh was featured in an advertising campaign for sportswear manufacturer Adidas alongside David Beckham and Muhammad Ali. Singh, who is a vegetarian, holds UK records for the 200 m, 400 m, 800 m, mile and 3000 m for his age group, records all set within a single 94 minute period. At the age of 100 (and a half), Singh attempted and accomplished eight world age group records in one day, at the special Ontario Masters Association. Fauja Singh Invitational Meet, held at Birchmount Stadium in Toronto, Ontario Canada. Timed by officials in Canada, Singh ran the 100 metres in 23.14, 200 metres in 52.23, the 400 metres in 2:13.48, the 800 metres in 5:32.18, the 1500 metres in 11:27.81, the Mile in 11:53.45, the 3000 metres in 24:52.47 and the 5000 metres in 49:57.39. Each time bested the previous record in that age division (some events had no previous record holder as nobody over age 100 had ever attempted to run the distance). Some of his marks are significantly superior to the listed world record in the M95 age group as well.